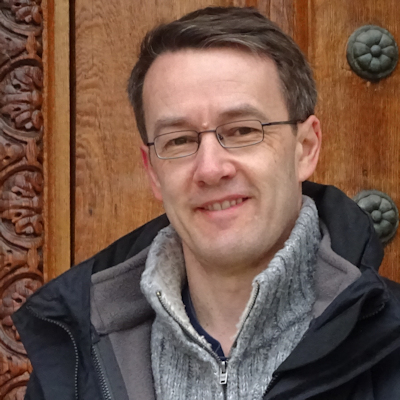 Today I am welcoming a very special guest to From Pemberley to Milton: Mark Brownlow! Thank you, Rita, for having me on your blog! When you think of Pride and Prejudice, I bet it’s not just the characters and story that come to mind. 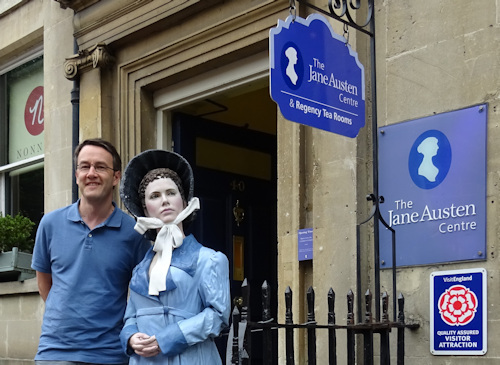 We all have vivid images of the houses, villages and towns that feature in Jane Austen’s novels, whether through our imagination, through the TV and film adaptations, or through visiting places like Bath, which hosts much of Persuasion and Northanger Abbey. I was lucky enough to spend much of my childhood near Bath, in a village outside the market town of Devizes, whose cheesecakes Jane Austen once praised in a letter to her sister, Cassandra. Devizes is also close to Lacock, which featured in the 1995 Pride and Prejudice TV series. Unfortunately, I only had eyes for football back then. By the time I discovered an appreciation for classic literature, I had moved to Vienna (which I’m pretty sure Jane Austen never visited). …the memories came cascading back. My delight at discovering a Bennet Street. The sumptuous buns I used to buy by the dozen, their fragrance tormenting me until I reached my lodgings. The bookstores on Bond Street. The young ladies taking walks across the Crescent Fields and on through Cow Lane to Weston. I wondered if they would remember me, some twenty years later. I also met Mr Bennet himself, outside the centre. I didn’t have the courage to tell him I was writing his memoirs. Bennet(t) Street passes the Bath Assembly Rooms. Of course, the Meryton Assembly Rooms play an important role in the Pride and Prejudice story, whose first part provides an ongoing backdrop for my book. In this excerpt from Cake and Courtship, Mr Bennet is determined to learn more about the art of courtship so that he might help his young friend. He listens to the family’s description of the Meryton Assembly with more than usual attention. I hope you enjoy it! Like shot birds, Mrs Bennet and the girls thumped down into sofas and chairs to sit motionless as they gathered strength for the traditional post-assembly review. Kitty announced their return to life with a giggle, no doubt remembering a touch of a gentleman’s hand on the dance floor. Then she and Lydia fetched cold meats, bread, and wine to provide stronger fare than the titbits of gossip now to be shared. The kitchen table, room bereft of cooks and servants, played host to this feast. “Mary danced with Mr Toke,” whispered Lizzy as I tore off a lump of bread. “I am sorry to have missed that spectacle,” I whispered back. “Toke dances like an overburdened merchant ship, unable to turn easily and always on the verge of capsizing. It is a most diverting sight. Still, Mary seems to have survived the ordeal well enough. You enjoyed the dance, Mary?” I said, raising my voice. Jane turned her face away. I could not see in the dim candlelight, but I was sure she blushed. “So tell me, how did you all divine Mr Bingley’s attachment? What did our friend do to inspire such a diagnosis? What makes him so worthy of admiration?” Curiosity crept across Lizzy’s face at my questions. No satisfactory answer was to come, since Mrs Bennet and our two youngest took my words as a cue to rattle off a series of compliments on Mr Bingley’s cheekbones, chest, legs, and other favourable features. The girls regarded him as perfect, a declaration that revealed their lack of experience with men. Even Achilles had his heel, though I daresay Mrs Bennet would have forgiven him this blemish given the likely size of his olive plantations. “He impresses with his conversation,” said Jane. “He is—” began my wife. “He complimented me on my gown,” said Kitty. The title alone makes the book worth a read. Interesting premise. Love the post and excerpt Mark! Best wishes! I skipped the water, too, I must admit. I loved Bath when I visited especially the fashion exhibition in the Assembly Rooms. I am wondering if we get to hear Mr Bennet’s opinion on Elizabeth and Darcy, and if Wickham appears in this book I’d like to know whether Mr Bennet is taken in by his lies along with his family. Love the giveaway choice. A book or chocolates? Not an easy choice but I’d probably have the book, even though the chocolates are Viennese. The book would last an awful lot longer! Thanks to Mark for sharing this exverpt with us. It sounds like a lot of fun! Thank you for the excerpt and chance to win. My goodness, Jane is ignoring you in that picture! LOL! As for Mr. Bennet trying to ‘gather’ information without letting on the real reasons, was fun but Lizzy certainly thought it out of character! Loving this blog tour and the snippets of information we are receiving! Thank you! Thanks, Carole. Yes, next time I will have to ensure a proper introduction. I already read your 1st novel and albeit a short one, it kept me hooked from cover to cover. I enjoy reading your writing style and so I bought the kindle version of your book and am waiting with anticipation to start reading it. Mr Bennet has long been a favourite character from P&P. Such an imperfectly perfect father, husband and cousin to Mr. C. I can’t wait to have my rendevouz with him. Thanks, Diana. I like the phrase “imperfectly perfect” to describe Mr Bennet. Thanks to Rita for hosting and thanks to our author for the excerpt and the giveaway. I love the pictures as I doubt I will ever cross the pond and see the sights for myself. I always appreciate someone giving me a tour even if it is in my imagination. Blessings Mr. Brownlow on the success of your debut book. I like the way you weave in the classical reference. An allusion to Mr. Bennet’s education and learning. And this is how educated 18th century people talked, with lots of classical and biblical references in their speech. I’m fortunate that both my mum and sister still live in the area, so can drop into Bath every year. what a fascinating POV to use in a variation, loved the excerpt. quite the background for our author, Mark Brownlow. I can see how his background in various types of writing such as the “agony aunt” could help in writing multiple characters and personalities. Thank you for the fabulous guest post. Oh wow, you can truly can inspired by anything!! Good luck for your book, Mark. The excerpt was perfect! I must confess that I received the most pleasure about your statement that you stood next to Mr. Bennet but didn’t tell him that you were writing his journal! Thank you for the giveaway. He’s a larger than life character in Bath and I was quite intimidated! Thanks. 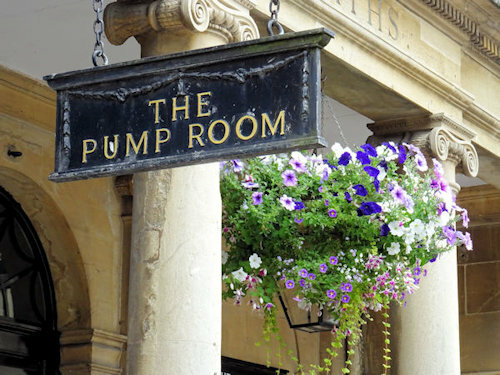 One thing I’d like to do next time is try a Bath Bun at Sally Lunn’s bakery – the building dates back to the 15th century! What a sweet title. The book sounds very interesting, it’s rare to ever read from a pov that isn’t Elizabeth’s or Darcy’s, I’m intrigued. I am definitely interested in this story. The chocolates would not be turned down but the book is my first choice. Following this blog tour and looking forward to reading this unique POV. I am sure much will be amusing. Thanks for sharing. Looking forward to seeing into Mr. Bennet’s thoughts! Thanks for the excerpt! I love the photos! Any glimpse of Bath and its great architecture is enjoyable! A Bennet Street in Bath? It has not been highlighted on blogs and websites that I’ve read but then I’ve not travelled England. If I do, Bath and London will be on my list of places to visit. It’s a joy to read an excerpt from Cake & Courtship. Thank you for the chance to win the book or chocolate, Mark. I would like to say my two cents about a male writer for an austenesque novel. 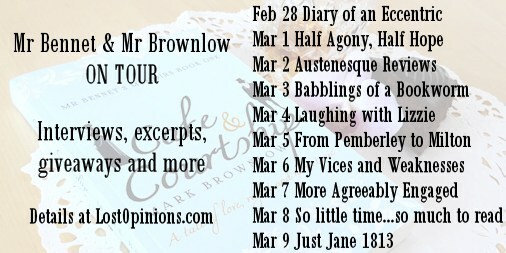 Mr Brownlow is a male writer and, as I have read in one of his interview for this blog tour, he writes from the point of view of Mr Bennet because he feels himself nearer to this character. But nothing prevents him from writing from the point of view of a female character if he feel himself closer to her point of view. In my modest opinion this depends on the period of your life you are facing and from many others factors. For example, I read a book by a male author that wrote one of the best love scenes I have ever read from the point of view of Caroline Bingley! If I may jump in…I would agree that it’s down to the individual which POV they feel comfortable taking. And the reader will be the ultimate judge of whether the author did a good job or not!